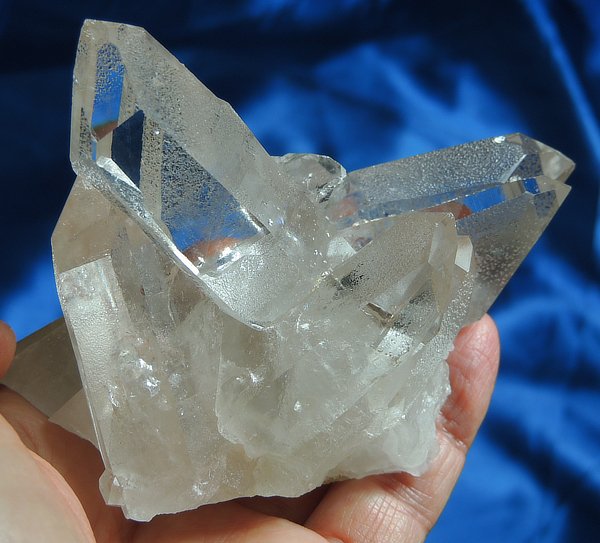 This is a very clear and slightly smoky 8.6 oz, 4” by 3.1” by 2.2”quartz cluster from Brazil and the only cluster in the shipment. The faces hold curious, round markings … they are subtle so best to check them with a loupe! Like the Libra, all sides have starbrary glyphs but some have sides only have a few … and all of the points have the glyphs but the small DT, ultra clear non-smoky student sitting in the middle of the cluster. The glyphs are sweeping and seem to describe movement from top to bottom like flying saucers or some kind of space craft. You will see many, many little circles on him as well as many minute inscriptions. The base is flat with an area of teeny quartz druse right at the bottom. There are keys around the sides as well and the base is healed. There are some tiny dings but nothing of significance … he awaits his special Keeper! Starbraries are recognized by the presence of glyph-like markings, symbols and geometric patterns plus usually a doorway or key. By aligning fingers with the doorways or keys, you can unlock different layers, depending on orientation. Companion crystals are important - they either come with the crystal (purchased with or given with) or appear shortly thereafter. They don't have to be quartz, but work with the main crystal to unlock different layers or even gain access to the crystal itself. All Starbraries work like that - the companions facilitate access, although it's possible to gain access just from the Starbrary itself. All of the starbrary formations hold information of peoples who had a positive influence on human growth and evolution. The records were left here so that in the event of catastrophe, there would be a permanent record to help Earth rebuild. Starbraries were placed in many locations so the records could be accessed by peoples all over the world. There are sets of crystals - like chapters or series. When one comes to you, all of a sudden, you will find many more. It is important to ask the order to read them. The Corvus starbraries derived from the Corvus Star Peoples are fascinating. I am reminded again of Native American lore with the raven … the Keeper of Secrets and the bringer of messages from the heavens. How perfect for these starbraries and it is known that the Native Americans had many encounters with the Star Peoples and so the Raven is a very apt description of them. Norse mythology also describes Raven as being held by the Noses god, Hugin who represented the power of information. Do you see the similarities? The Corvus Peoples brought information from all their travels for the consideration of the Earth peoples. Much was science-based including mathematics, astronomy and physics, but some was metaphysical and taught the relationship of all things energetically. It is a vast learning opportunity to work with a Corvus starbrary!